For the first recorded time, a dolphin has been observed communicating with her unborn baby through whistles -- a breakthrough discovery that may have big implications for sound in the ocean. This signature whistle is used to imprint with babies, or dolphins use it to announce themselves when they come in contact with new dolphins, much in the way a person uses one name throughout their life. It was unusual for Bella to make the sound in her last trimester, before her Jan. 14 due date, because it's a sound trainers rarely hear in the pool, as all the resident dolphins are too familiar with one another to use name whistles. The phenomenon caught the eye of researchers at the Marine Mammal Behavior and Cognition Laboratory at the University of Southern Mississippi, who were dumbfounded at the discovery. "We don't know how unusual Bella is, because there is virtually no research out there about how newborn dolphins learn to communicate," said laboratory director Stan Kuczaj. "It's a big ocean and impossible to study this in the wild." 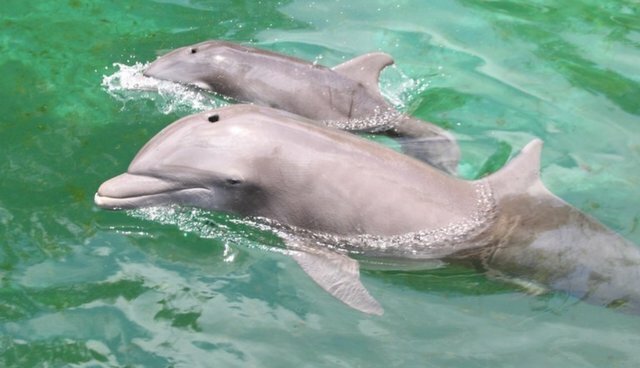 It's unknown whether unborn dolphins can actually hear these vocalizations, although MRI scans have shown that they are capable of making vocalizations themselves before birth. The discovery could have an impact on regulations for sound in the ocean -- a topic that is already the subject of heated debate. "There's so much interest in sound in the ocean," Holley Muraco, a marine mammal reproductive physiologist at the park, told SFGate. "If we know babies need to listen to their moms, it will have a huge environmental impact by letting us know that, 'Hey, we have to quiet down.' "